Colors is just colors our eyes like to see most, but when it render to the black color, sometimes we start having alot of question marks all over our head and the mystery starts. 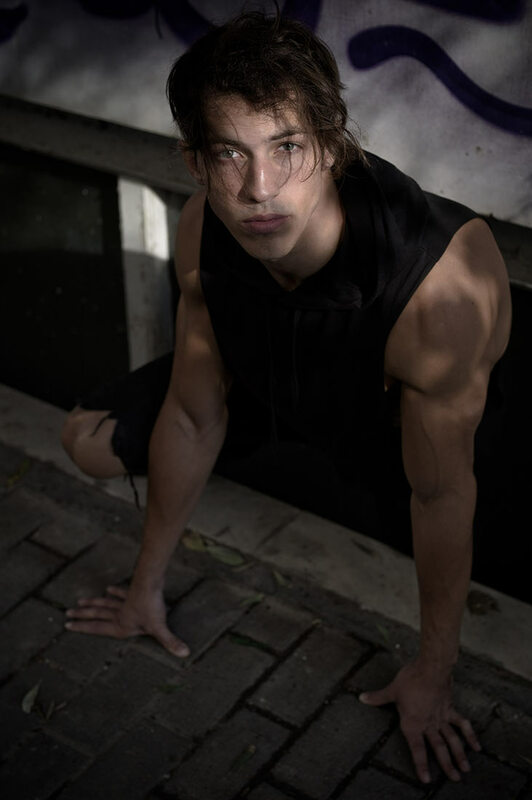 Our fashion photographer Ramsey Spencer wanted to have a Black theme editorial with the perfect model that he was in search for quit a while, until he met model Christos Katsavochristos. The model was with amazing blue eye and long hair and body was sick fit, a dream of every man to have. Pairing the model with few black outfits was the key to this editorial, wanted to see the model through the darkness of what he was wearing for the shooting, after few looks it start unveiling with his great body physic that Christos got. Highlighting the model with great touch of the photographer was just superb, signature style and amazing attitude, we got from the model what we needed as his hard work out shown in a perfect way not like any others. What we got from all this? at the end, its all about personality and how you show it thought your body. Sure everyone works out and got a body, but getting the right personality makes you shine as star even in the dark. Everyone is shooting body today, but its meaningless without a strong concept behind it. Thats why we wanted to be very unique with this editorial to make it glow in the dark from amazing look outdoors and amazing great body indoors, and thats why Christos Katsavochristos was the face and body model for it. We call it : The model who got it all.